As I emerge from the customary post-NAB haze and try to formulate a coherent analysis of the 2016 show, perhaps the most striking realisation is that despite pacing the halls for four long days, I barely scratched the surface. The scale of the event, much like Las Vegas itself, is simply extraordinary, with over 100,000 attendees and nearly 1900 exhibitors. Right from the first morning of the show, my social media feeds have been full of reviews of “amazing products” and “technical advancements”, many of which I just didn’t get time to see. Here, however, are some highlights of the things I did manage to get to. Even before the show properly started, Ross staged an impressive 800 seat mini-conference, with David Ross evangelising on the new product lines. Among a plethora of new toys was the surprising launch of quite possibly the only sub-4k camera seen at NAB. Their “Acid” camera has been developed specifically with green-screen applications in mind, as they felt that dedicated camera companies were not giving the attention required to that specific application - a field that Ross covers so well with all the other surrounding technology. Whilst the cameras they’ve introduced are “only” HD, crucially they are 4:4:4 sampling, giving the full colour range for the best results in chroma-key environments. Ross also introduced a smaller mixer into their Carbonite range - the Black Solo - which is aggressively priced and can be supplied in any of 3 configs. It’s clever, and is perfectly suited for small AV / small truck applications. And coming from Ross it’ll work when it turns up, and keep on working. On the other end of the mixer scale, SAM ( the new Snell / Quantel merged business ) were flat out with enquiries and demo’s for UK Broadcast and OB clients. As well as the hugely powerful headline Kahuna mixer which caught my eye, they had a very familiar looking instant replay device. The Quantel side of this business always did make quality, intelligent storage replay solutions, and this one looked like it might be able to succeed in a market place dominated for so long by EVS. EVS themselves have never sat still, despite their powerful position. Of all the businesses selling kit, there is perhaps only Arri in the camera market which even comes close to possessing a “must-have” product in a particular sector. It must be a lovely place to be. EVS were promoting a new server technology aimed at supporting sports officials. Named Xebra, presumably named after the black and white uniforms of the American Football officials ( but with a gimmicky “X” instead of a “Z”), it is a multi-viewer showing up to 8 simultaneous angles of a particular event, which allows for faster mid-game decision-making. They also had a very neat C-Cast system. They estimate that over 90% of footage shot at big sporting events is never aired. C-Cast is an open platform that third party developers can write apps for, to review all footage and make 100% of the clips available to the viewers on demand for 2nd screen viewing. 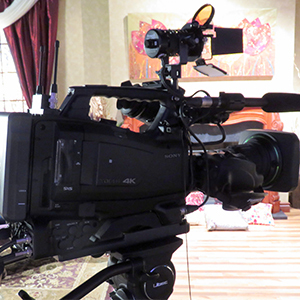 This allows the viewer at home to become their own director, with the ability to view different angles from the ones offered live on the broadcast. Carrying on the storage theme, both ObjectMatrix and AVID had new offerings. AVID's Isis on-line storage range is being superseded by Nexis, which is a totally configurable and scalable storage solution, with 120Tb of storage available in a 4u chassis for around the £40K mark. One of the key changes is a move from a Windows-based technology to Linux. The existing Isis 2500 and 5500 are due to go end-of-life in December with the 7500 following 6 months later, but AVID will still support the product for 5 years, as there are so many still in the market. 5 years seems a sensible period to cover this type of technology. Another key technology development announced is that files can now be edited in Adobe Premier. Similarly, Object Matrix were keen to emphasise their compatibility with other storage manufacturers such as AVID, and their Matrixstore product, offering off-site cloud storage for disaster recovery scenarios seemed pretty slick. They seem to build pretty robust architecture and have been successful selling their wares in to banks as well as in to media, which gives some credibility to their claims of being secure. Off-topic slightly.. am I the only person who didn’t know that all of their products are made in sunny Wales? Editshare had a sizeable presence and were promoting their XStream EFS file storage. This Enterprise level solution is well priced against its leading competitors in quite a crowded sector, and if a busy stand is any guide to success, then they seem to be doing very well. Arri was interesting, although perhaps more for what they did not announce, than what they did. The launch of a new sensor must be imminent as the current 3.2K sensor has been around for some time now. They have used some of the processing technology of the Alexa 65 in the XT to launch an SXT camera to gain even more performance from the existing block. Any existing XTs can be upgraded by Arri to SXT, by adding a new side panel to allow the camera to record on to new Codex-made large drives. 4K onboard recording is now possible, and new cartridges are also available so the existing recording media (SxS and CFast ) can still be used. Netflix is now the single biggest commissioner of TV, and with their 4K end-to-end requirement, this currently eliminates the Alexa. I find it incomprehensible that footage shot on a 4K, £1,000 “handycam” is acceptable and the beautiful images that Alexa captures are not. Amazon has already relaxed its criteria, but there is no sign of Netflix following suit, so Arri will no doubt have to launch a 4K+ block. And in the meantime, they will continue to revel in the huge market share they enjoy with the existing block, a commercial cash-cow if ever there was one. Panasonic were still very active with their Varicam and Varicam LT high on the agenda. I’m told that over 50 LT versions have been sold in Europe, with a significant production currently shooting on the camera. It seems that the Varicam “look” is still in demand, and the Dual Iso recording levels are desirable. Panasonic also have an amazing 46% global market share of PTZ cameras, with major installs going in all over the place. Sony announced a couple of new and interesting products. The HDC-4800 is their new 4K studio camera and the first solution capable of shooting 4K in a higher than real-time frame rate. Up to 8x is possible in 4K, and 16x in HD, but it’s a single Super35mm sensor with a PL mount, so the same shallow depth of field issues will apply that made shooting sports on the F55 tricky. Also, such is the volume of data coming off of the block that you require a dedicated HDCU-2000 and a BPU-4800 video server. The BPU can interface with existing OB server technology to provide the highest quality slomo images currently available. At a price tag of around 250K though, it will be a very select client base. A somewhat understated announcement was an option board for HDCU-2000 series CCU’s which can up-res the HD camera to 4K. With so many HDC-2500’s around, this could be a popular solution. This option board will be available around IBC time, but it’s worth noting that the HDCU-1700 will not accept this option board. Sony also announced the PXW-Z450, a new shoulder-mount 4K camcorder as I had predicted. However, rather than using the 3 x 2/3”4K sensor configuration that they employ in the HDC-4300, they’re using just one of these sensors in the camcorder, making it a 4K, single sensor 2/3” camcorder. The set up on the stand, and my poor cameraman skills couldn't really show me if the camera was going to have the same depth of field issues as other single sensor cameras. As it’s a “traditional” 2/3” sensor, it may not, as physics dictates that it’s the sensor size which affects the depth of field rather than the number of sensors. There are also 3 viewfinder options - the L10, L20 and L30 - to give the beleaguered cameraman a fighting chance of getting the shot in focus. Canon were show-casing an amazing technology display, with a C300 style camera with an 8K sensor, outputting raw on to 4 Odyssey recorders. The images were extraordinary. It could not be used on set in this configuration, but was interesting to see what we might see in years to come. They also had their low cost CN7 replacement, the CN18-80 4K lens which was very popular on the stand. Interestingly, there is an argument that what the Broadcast industry really doesn’t need are more high-resolution, HFR, HDR cameras. We can now record far more detail than we can hope to transmit. 15+ stops of dynamic range, ever increasing frame rates, 4K and beyond capture, and yet the vast majority of TV is still being delivered in either HD or even SD, and more likely than not in Rec709. Is everything that is shot really worth archiving for future broadcast? Fujinon had a number of new lenses, including the longest lens in its class, the 107x box lens. They also had their 80x lens which had a feature I really liked. Sports generally like a 95x zoom as this covers most football stadia. Fujinon made the 80x lens that covers most other sporting arenas, and as with any box lenses it has a 2x extender which doubles the magnification but significantly reduces the light passing through the lens. Uniquely, the 80x lens has a 1.2x extender in addition to the 2x extender, which gives the magnification required, and loses significantly less light than the 2x extender. There were also a couple of ENG style 4K barrel lenses launched, and I doubt we will see another HD lens launched now, such is the move to 4K. Newtek are never backward in coming forward with new technological advancements, and they are leading the way with an open-platform NDI technology which allows for easier sharing of files. All of their products are compatible with this protocol, and I gather that over 200 companies have announced products embracing this technology. One specific development I particularly liked is their Skype Talkshow, which now allows for 4 channels of Skype to be managed through a single 1ru box. I really don’t understand why these boxes have not been adopted more widely. Skype is used universally, and these boxes significantly improve the image quality and workflow of Skype in a broadcast environment. Whilst walking the halls, it’s possible to become a little immune to the incredible equipment on show. Mind-blowing technology and resolution that a non-industry person would find dazzling has become the workplace norm for us. I confess I felt this sense of 'tech fatigue' until I saw the Cooke Anamorphic zoom lens. It gave me that real “Wow" factor from the moment I saw what it produced. It's a front anamorphic lens, not a rear anamorphic lens, meaning the “squeezing” lens is in front of the iris. And it’s a consistent T3.1 throughout its 35-140mm range. But that’s just detail. Immediately, as I sat in front of the lens I was suddenly in a feature film, such was the effect that the lens gave on screen. And with a standard set of Cooke prime lenses covering the same range as this one lens costing over twice as much, I see this lens being in huge demand, despite the c18 month lead time. Great, innovative work Cooke. As for a general show theme, some standardisation would be helpful. David Ross in his Ross Video opening statement spoke about there never having been a more confusing time for the broadcast industry. HDR is gaining huge momentum with every broadcaster manufacturer involved, but which version? There are already 3, and maybe even more by the time you’re reading this. 4K has become mainstream... or is it UHD? New protocols, more K’s, and certainly less D’s. My back of fag packet equation for good TV reads something like this...3D -1D + HDR + 4K + quality content + a good camera operator = fabulously immersive TV. VR and 360 shooting seems to be gaining some momentum. Clever image stitching software seems to be making this the likely next big thing. TVU were even able to transmit a live VR image over a mobile phone network with only a 6ish second delay. I was reading recently about the advances in AI, and far from technology reaching a pinnacle, we need to brace ourselves for ever greater change. Our view of what is possible is governed by what has happened, not the rate at which it happened. Ever heard of the Law of Accelerating Returns? Put simply, it means that more advanced societies develop faster than less advanced societies precisely because they are more advanced. Think of the film Back To The Future. Marty was amazed at the changes that took place in the 30 years between 1955 and 1985 in TV formats, the style of music, and the price of a soda. These are big changes, but not unimaginable. Move on 30 years from 1985 and the internet has transformed our lives. We take for granted Google, Facebook, Uber, online shopping, amazing medical advances, Wifi, Bluetooth, iTunes, Amazon, Bitcoin, 3D printing etc. These advances are exponentially greater than the changes between 1955 and 1985, and it follows that the next 30 years will see advances greater than we have seen in the last 30 years. It will not stop. Food for thought here. On my fourth day in this industry, back in April 2000, I spent a day at Sony learning about their products. The Sony Account Manager said the most ridiculous thing. He said that in 10 years, we’d be watching TV on the internet. I was pleased to hide my dismissive scoff at this ridiculous concept. Doh! A note of praise to the NAB organisers, which resolved a huge issue for all attendees previously - the ability to collect entrance badges from the hotels saved hours queueing on the first morning. And the shuttle buses were also excellent for the attendees, if not the cab drivers. Small improvements like this transform the NAB experience. Also check out Peter Savage’s article on Page 44 where he highlights his top 5 products at NAB. Feel free to comment with anything I missed. I know I probably missed as much as I saw. In true Rumsfeldian terms, I don’t know what I don’t know.